In our little cabina in Costa Rica, from where we have just returned to the depths of winter and are now tucked up in our little woodland home, we cooked simply with organic produce from the local shop. As is always the way, abundant sunshine produces such flavoursome and nutritionally dense foods that creating healthy meals is somehow simpler, decisions come more easily, and this new flow with native ingredients is always fun to explore. For one, we discovered that Sasha could live off papaya, gallo pinto (traditional rice and beans) and fresh raw goat milk; for another, bundling ingredients into one small corner of the kitchen and working with a few spices bought in our case by Ben who is a genius in the planning stakes, each morning when we ate in, I found myself diving into yet another riff on an all time favourite: porridge. You can never have too much. The spiced part of this nutritional recipe is delicious in any clime (perhaps even more so here in cooler temperatures), the delicious cardamom and grounding garam masala reminiscent of a cup of chai or a sweet Indian delicacy; the tahini part happened because I bought too large a jar for our stay and constantly felt I had to use it up (also great in smoothies with a banana / date / cacao / oat base), and realised only later that it perfectly matched the calcium I was craving while breastfeeding like crazy, not getting many dark leafy greens and avoiding dairy except for stealing Sasha’s goat milk which was one of the most delicious things I have ever tasted. It broke down my old intransigence around animal milk and I was powerless to say no. 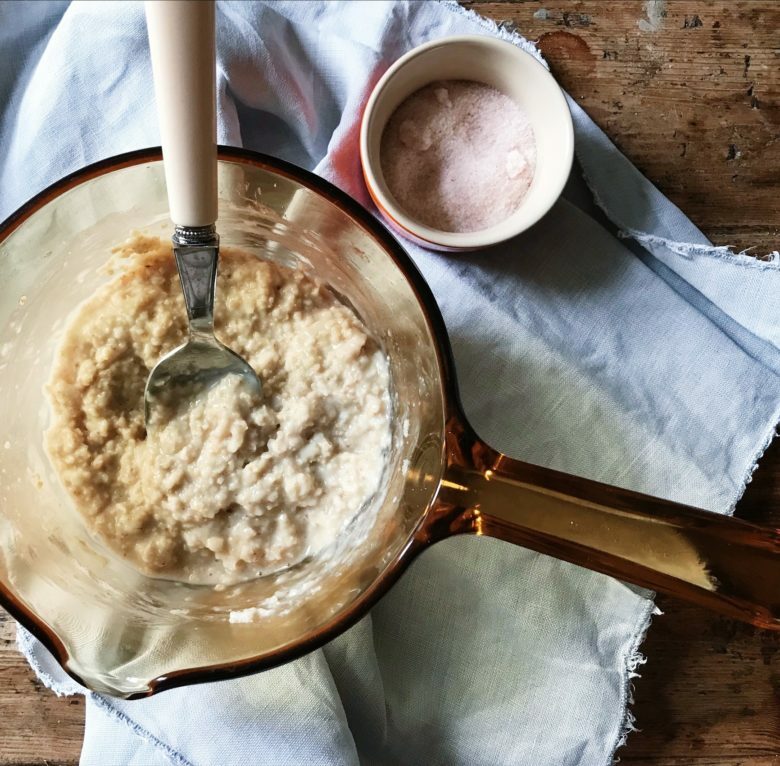 The coconut oil here is key, providing a healthy amount of fats (you could also add some chia), and the overall result is a deliciously rich bowl of porridge that, unlike many oat-based breakfasts, keeps you full and energised well into the morning. 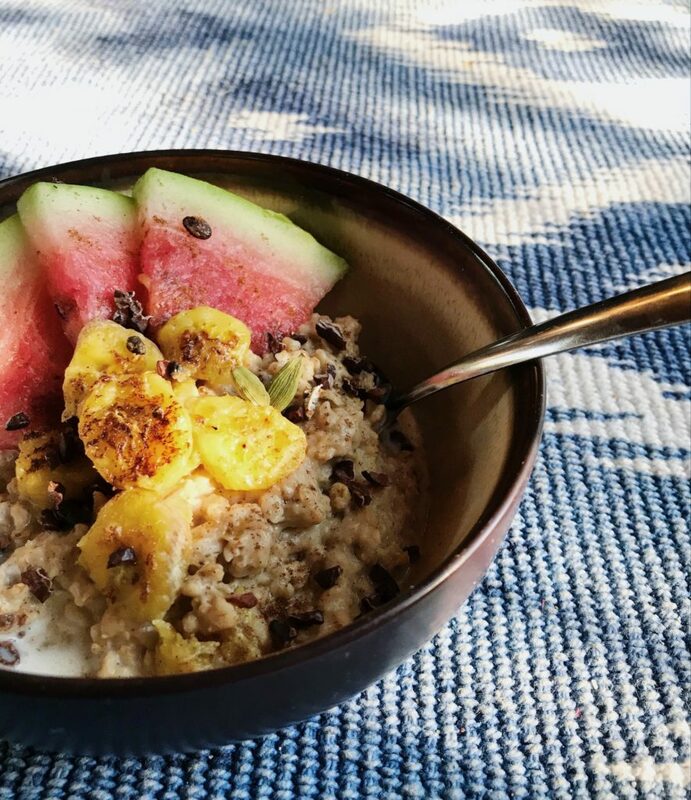 (Oats need to be supported by decent protein or omegas or they often give those of us with quick metabolisms a steep carb spike and then we are hungry again by 10am). Add gently browned banana slices and oodles of fresh fruit, and you’ve got a rainbow bowl of goodness and vibrancy to groud you into the day. 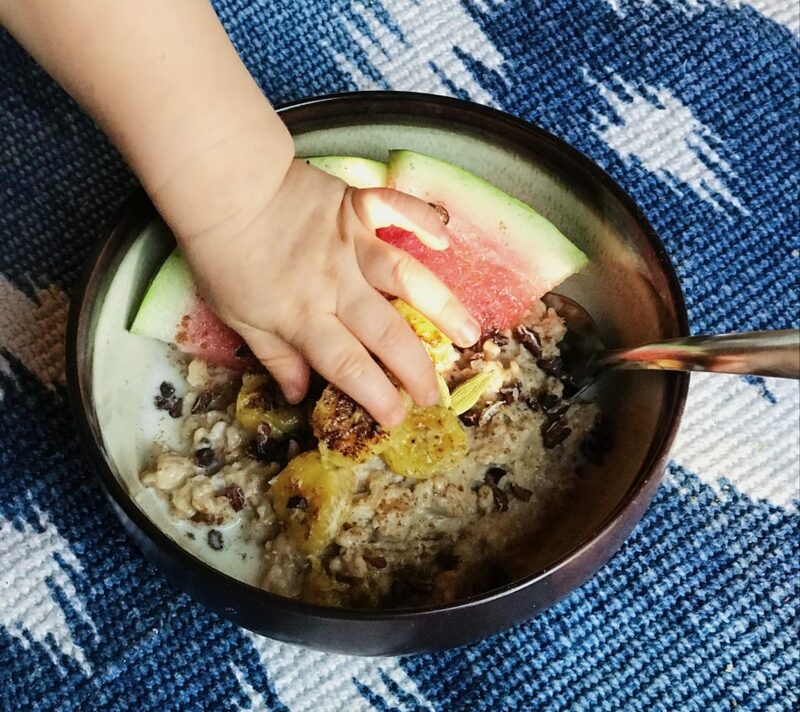 Finally, I added cacao nibs for a little crunchy anandamide action, but for anyone with a little one in tow these are best avoided due to the caffeine content. 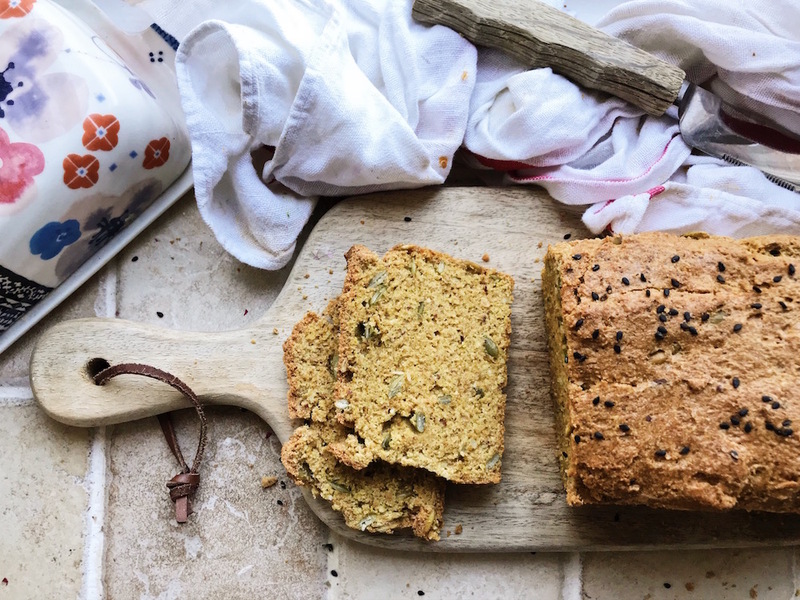 The ingredients are a little rough as I didn’t measure the spices and tahini with anything precise but it’s a throw-it-all-in sort of breakfast and you can’t go too far wrong if you follow your tastebuds. In a saucepan, mix the oats and water on a medium heat and simmer gently until creamy. While they are cooking, add in the salt, spices, 1 tbsp coconut oil and the tahini and mix well. Meanwhile, slice the banana and gently sauté in a pan in the remaining coconut oil until brown on both sides. You might like to sprinkle them with a tiny bit of salt. Serve the porridge topped with the banana slices, and optional cacao nibs, milk and fresh fruit.